“Project Paperback” – Filling out the shelf! | Home of the Thurian Saga Books! ← What’s in the backlog of things to do? “Project Paperback” – Filling out the shelf! Okay, so in this picture, you can see all 10 books of The Thurian Saga in paperback. The problem is, four of these books can’t be purchased this way, at present. “Project Paperback” aims to change that! As a side note, there is the one hard-cover book for The Rescue, but thankfully that book is already available in all three formats – Kindle eBook, Audible audio book, and paperback. The hard cover is an artifact of where I used to produce the books, prior. If you saw the prior post, I was attempting to get the editor revision of The Legacy of Aris out, which I did this weekend (whoopee!). I also wanted to apply edits for Ascension provided to me by Gavyn Lumier (done!). What this did, however, is put Ascension in the same boat, roughly, as Trials of the Teldear, The Fallen, The Summit, and The Ascent. 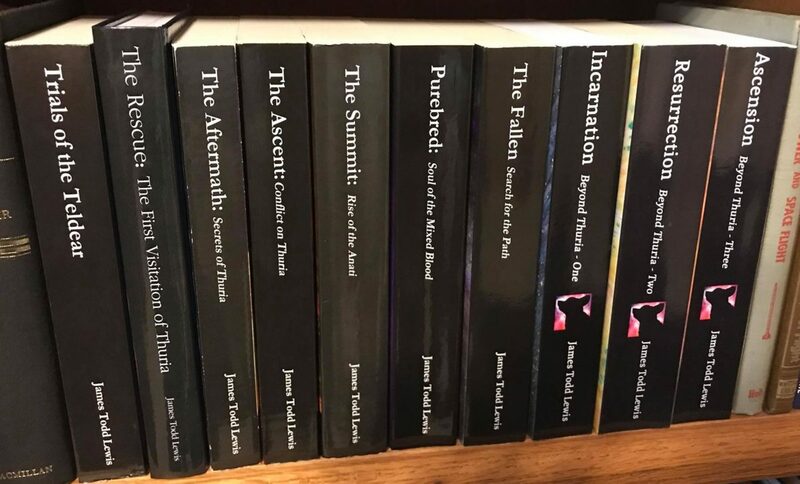 While Ascension obviously HAS a paperback version, it obviously needs an updated one. So, here’s what “Project Paperback” involves for these five books. Review – since these books were first written, I now have access to better grammar and spelling functions. Those are going to get a run through here to pick up any lingering things that could be fixed (and YES, much to my chagrin, there are things that need to be fixed even on a book released several years ago). Reformat – Several of these books were released ONLY as Kindle books, which means that the paperback version of the manuscript didn’t get a lot of attention. For example, I’ve already started with Trials and noticed issues with the section and chapter breaks. Those have to get resolved before the book can go to print. Re-Kindle – Well, it’s not fair to make improvements and fixes only in the paperback versions, and so the Kindle version will also have to be reconverted from the now updated paperback master with all formatting updated. Re-Covering – Uh, wonderful thing about an eBook – it doesn’t have a back or a spine! Creating a cover for a print book means building that cover based upon the length of the book (which influences the thickness of the spine) as well as the back and the front. This takes a bit of fiddly math to get right (and a few attempts). Re-Publishing – And, so here we go with five books, four of when aren’t simple updates. All four need new ISBNs which I’ve already assigned. Then, they have to uploaded to Amazon and accepted. Once that’s done, they’ll finally be live in the Amazon store, ready for purchase. It is a LOT of work to get done, but it’s the kind of thing that if I don’t do it, it will just get harder over time. The goal I’m setting for myself is a bit ambitious, but I want to have these done by the end of the year. Hopefully, then, in January, I’ll be ready to start writing again on the next book! Whilst I’m doing this, I hope to listen to some really great audio books from Amazon and perhaps replay some old favorites! Thanks, and see you in the future!